Filipinos are nationalistic people; we have a "national" everything. 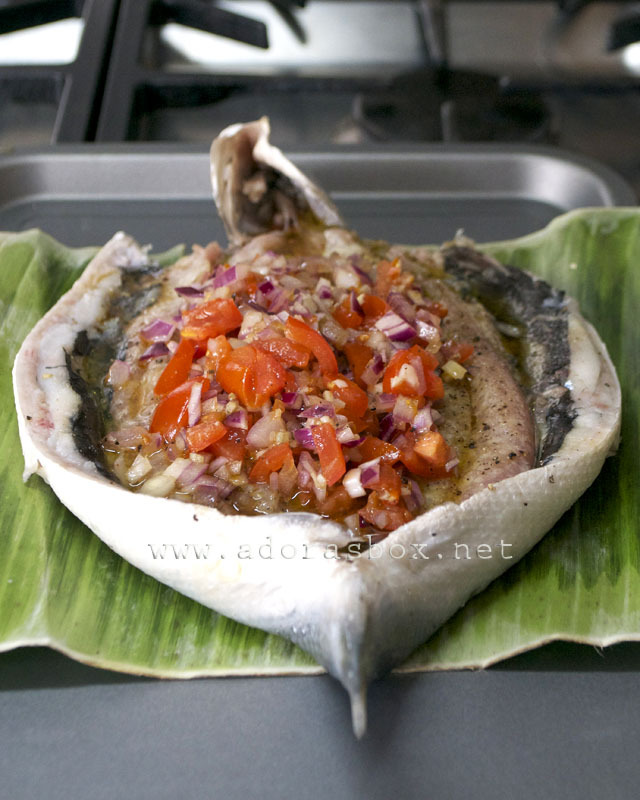 Bangus or milk fish is our national fish. Although it is full of fine bones and is fiddly to eat, we just love it. It is the height of summer in the Philippines around this time of the year. Although it is terribly hot, it is also incredibly fun. It is the time for fiestas and picnics. Going on a picnic is a whole day outing, usually with family or friends. The more rustic the setting, the better. The highlight is always the sumptous lunch. Everyone brings out their food and lines them up on banana leaves lining the table. Rice is always the main feature of a Filipino picnic. Everything else revolves around it. There would almost always be charcoal grilling involved. Pork, chicken and fish are usually on the menu. 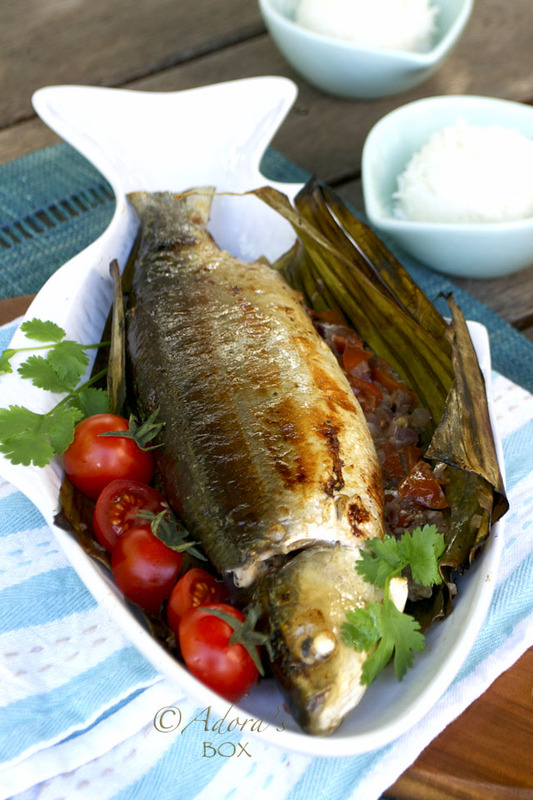 If bangus is grilled, it is always stuffed with onions and tomatoes. Bangus has a fatty belly but the flesh is very lean. Stuffing it gives it moisture and of course, more flavour. 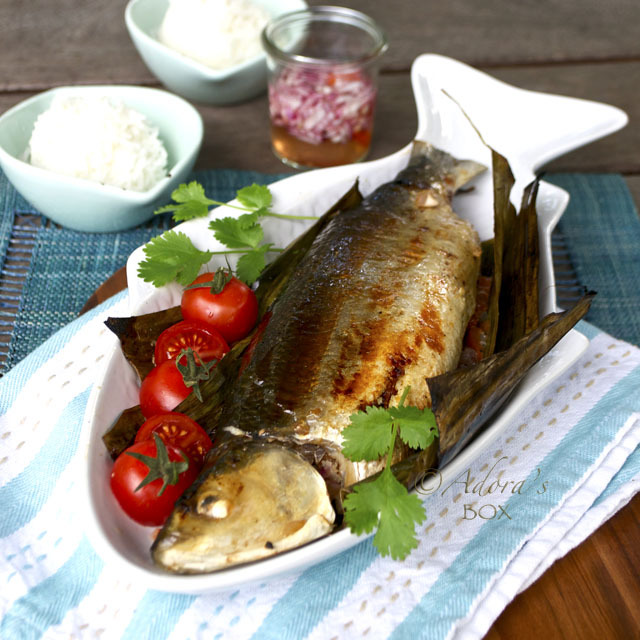 In a more local setting, It is usually wrapped in just banana leaves and grilled until the leaves char and fall off. I like my bangus done just right, moist and with a good amount of filling. It isn't easy to do all these at the same time. 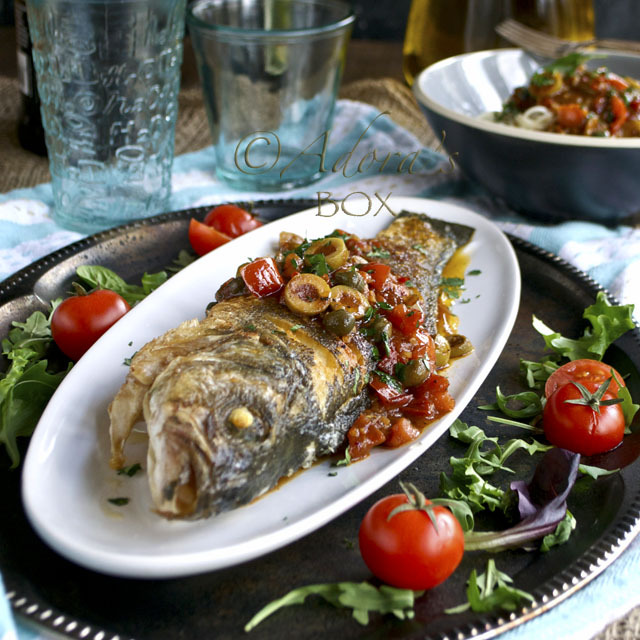 Sometimes the fish is overcooked and dry by the time the stuffing is cooked. My solution to that is to pre-cook the stuffing before using. That also jumpstarts the cooking process as the filling is already hot. Food like this are major rice magnets; they are so appetizing and so good with rice that you tend to eat a lot of it. It would have been a lot nicer to eat this if there were bamboo trees swaying and warm breezes blowing, and if it's not too much to ask, a gurgling brook. 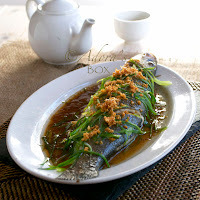 Season the bangus with the lime or calamansi, light soy sauce, 2 tsps. of olive oil and a pinch of black pepper. Mix the tomatoes, onions, garlic, sugar, a pinch of black pepper, 2 tsps. live oil and the fish sauce. Microwave on full power for 1 1/2 minutes. 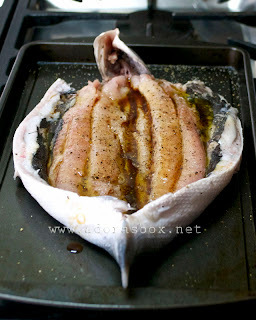 Drain the excess liquid then use to fill the bangus. 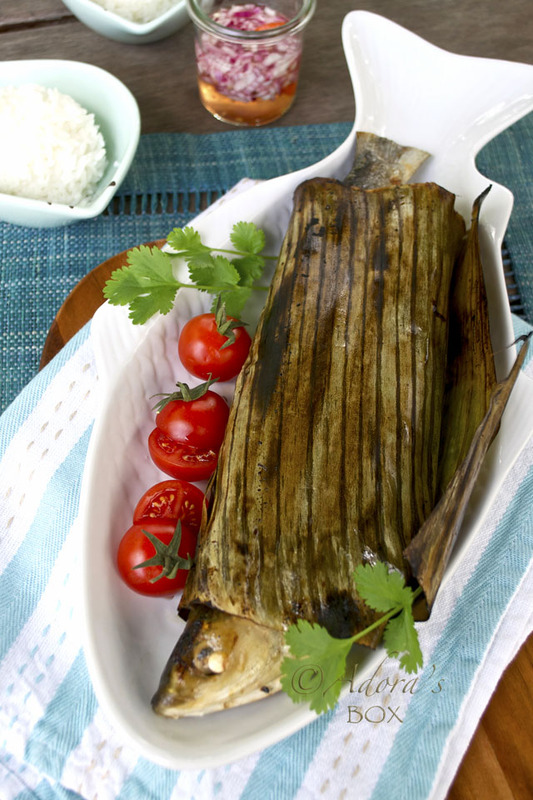 Wrap in a piece of banana leaf, then in foil. Grill for 10 minutes on each side. 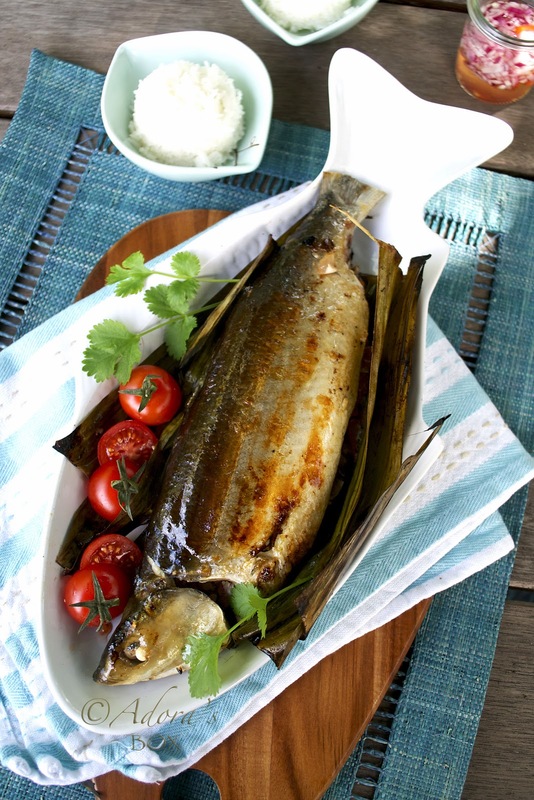 Remove the foil, leaving the banana leaf on, and grill for 5 more minutes on each side. 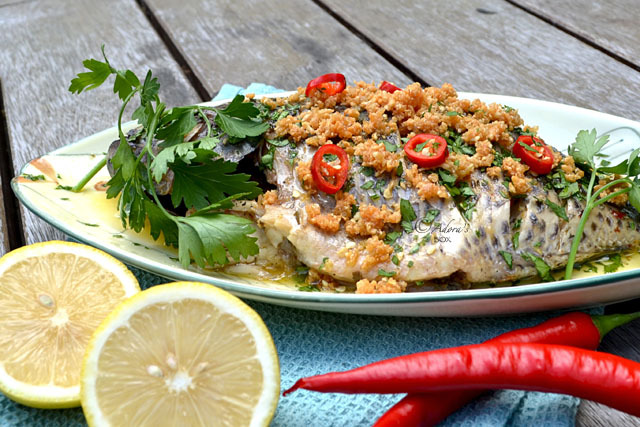 Mix all of the ingredients together and serve as a dipping sauce for the bangus. Baked the bangus in the oven today for lunch.. Hubby and kids loved it! Prepared one for the in-laws too. Thanks for this easy and delicious recipe! :) God bless you!